Ethnographic approaches associated with social and cultural anthropology are common currency in systems design. They are employed in academic and industrial research labs, consultancy firms, IT companies and design houses to understand user requirements, to develop design ideas, and to evaluate computing systems. Doing Design Ethnography is about one particularly influential approach: ethnomethodologically informed or inspired ethnography. This approach focuses distinctively on the embodied work practices that people use to conduct their everyday activities and to concert them with others. It enables system developers to factor the social organisation of human activities into IT research and systems design, and to do so with respect to its real world, real time character. 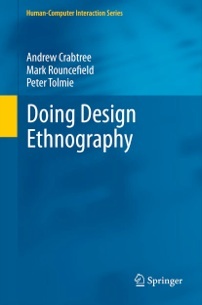 Doing Design Ethnography is the first dedicated practical text explaining how to do ethnography in a design context. Particular emphasis is placed on doing to convey and elaborate the approach as a concrete job of work consisting of particular skills and competences that are responsive to the practical demands of systems development. The authors work through a range of examples to elaborate key aspects of the job, and offer practical guidelines for researchers and design practitioners who seek to do ethnography for systems design. Andrew Crabtree (Associate Professor, School of Computer Science, University of Nottingham), Mark Rouncefield (Senior Research Fellow, Computing Department, Lancaster University) and Peter Tolmie (Senior Ethnographic Consultant, Mixed Reality Lab, University of Nottingham) draw on over 50 years of combined practical experience to creat this book, which will be of broad appeal to students and practitioners in Human-Computer Interaction, Computer Supported Cooperative Work and software engineering, providing valuable insights as to how to conduct ethnography and relate it to systems design.